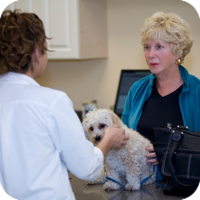 If you’ve just moved, you will want to locate a veterinarian soon. Don’t wait until your pet becomes ill; you want to establish a relationship right away. Your veterinarian can give you information on special climate concerns for your pet. In addition, since traveling can be a stressful experience for a pet, an early check-up may be in order.